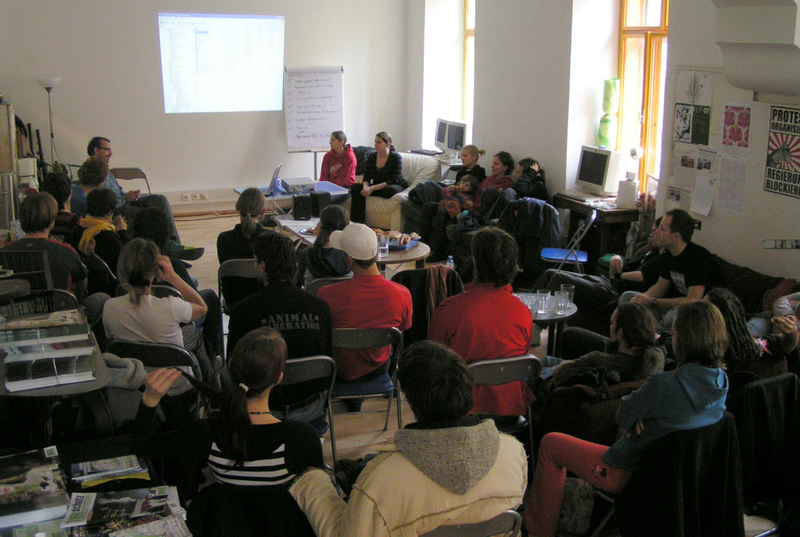 After Linz and Innsbruck, the third Animal Liberation Workshop for beginners took place in Graz from 10th – 11th November 2007. The venue was the Spectral, a place well known among political activists for its manifold events on criticism of the ruling system. Local activists used the Spectral kitchen to cook brilliant vegan food throughout the ALW. Even a variety of vegan cakes was on offer. A local vegetarian restaurant had donated a lot of organic vegetables. Nobody had to go hungry. 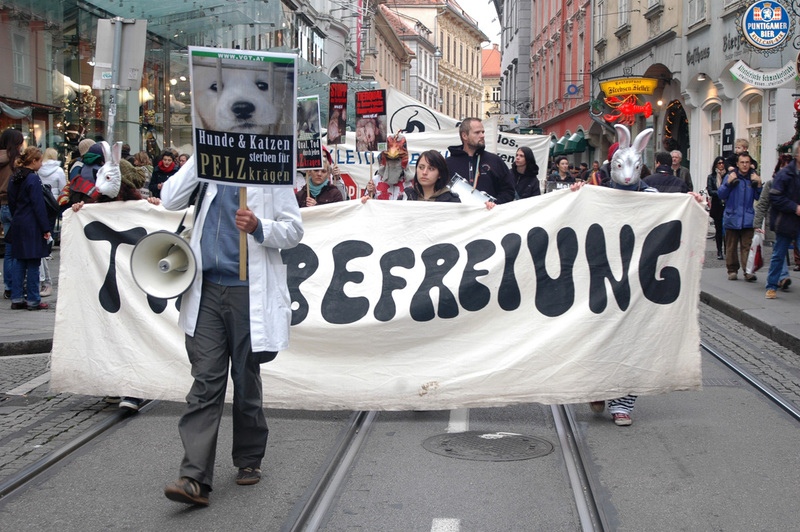 The animal rights movement in Austria is on an unprecedented high right now, especially in Graz. Mainly young people are willing to invest their precious time for the liberation of nonhuman animals. Never before were so many people active in this cause in Austria. To this particular event, 70 people turned up, who were spending a whole weekend debating ideas on how to be active most effectively. Saturday started in the usual way with short talks on the history of the animal rights movement and on its basic philosophical ideas. Both talks were followed up by discussions. 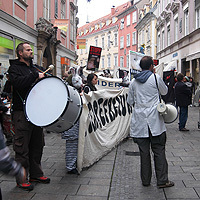 Then the daily routine of animal exploitation in Austria was demonstrated using recent pictures and films. Nobody could help being shocked of what was shown. After lunch, longstanding activists with more experience recounted stories of actions and demos they were involved in. Then, people gathered for the demo march through town. For most of the folk, this was their first demo ever. But the pictures of animal abuse just seen were still so present in their minds, that they shouted out their anger in front of every shop selling products of animal abuse the march passed. 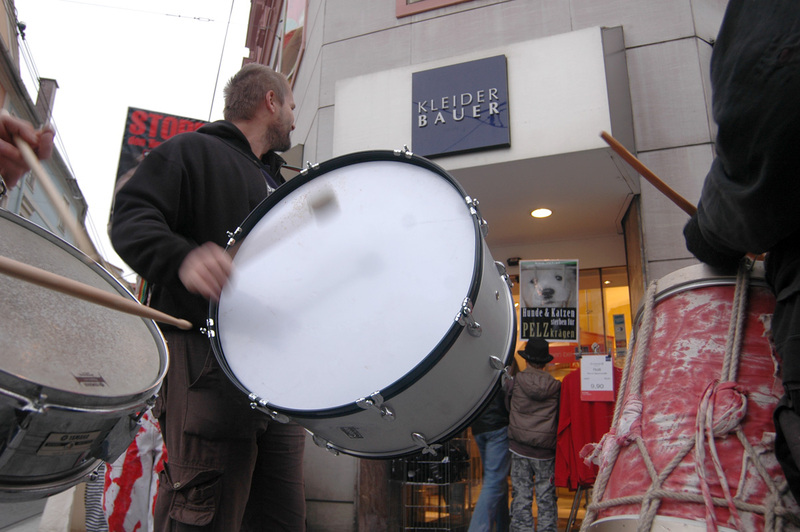 4 rhythmic drums made the chants the more impressive. A number of passers-by joined the demo and one of them even went all the way back to the venue to participate in the ALW for the rest of the time. 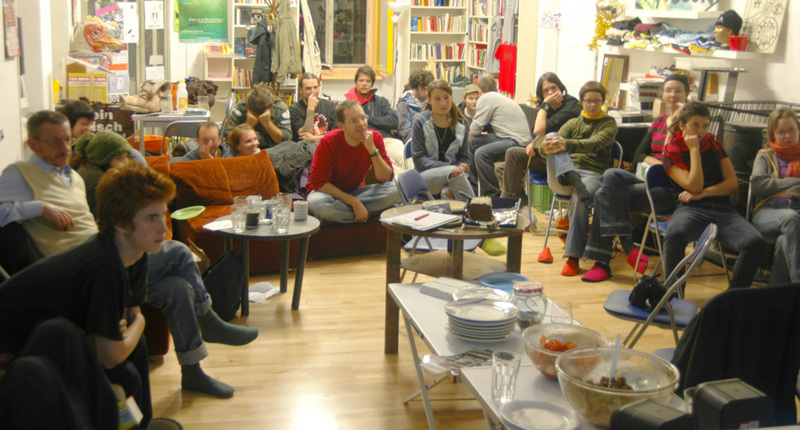 In the evening after the demo, a workshop on investigative activism was held and Jill�s film was shown, which depicts the life of late Jill Phipps, who died under a live transport lorry full of calves destined for European veal crates at the entrance of Coventry airport on 1st February 1995 in England. On the next morning, groups had the opportunity to introduce themselves and try to recruit activists for their particular activities. Also, national campaigns were explained in order to gather support from the new activists. 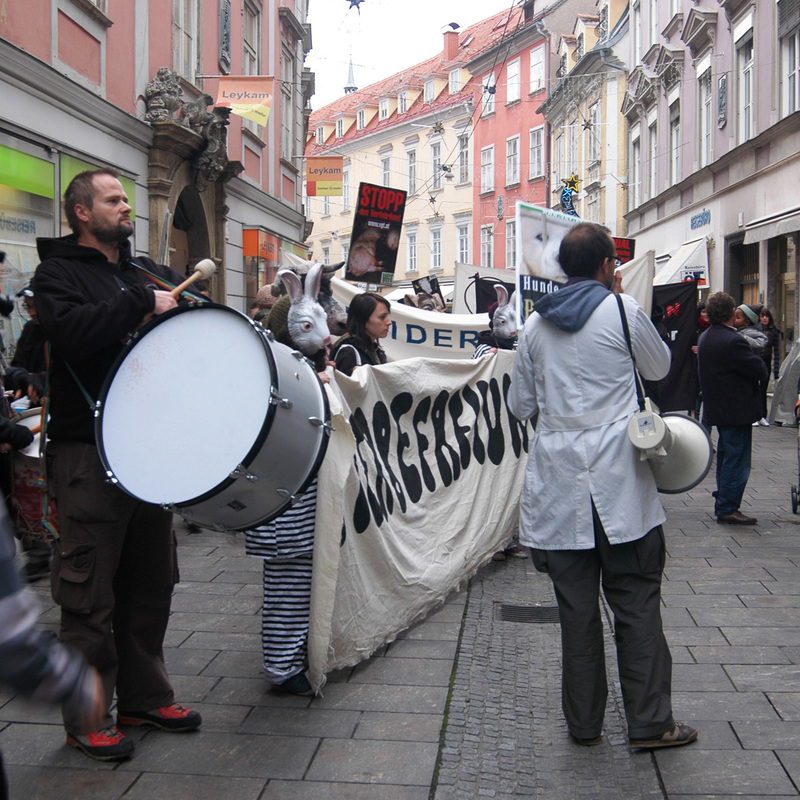 A number of participants at the last ALW 2005 in Graz had formed a new regional animal rights group, which is still active, mostly with weekly demos, live transport investigations and visits to schools. A clear proof, if there was the need for one, that the ALW serves well to empower people to become active in their own ways. On Sunday afternoon, ideas on arm chair activism, how to be active from home, were debated. In Austria, there is a national arm chair activism newsletter alerting people weekly on different topics they could get involved in via the internet. This workshop was followed by a brief talk on "why vegan?" and an intense debate on personal experiences with veganism. That helps to give new people the confidence to go vegan, but also to support vegan parents, who might get worried due to uninformed medical advice by their GPs. The Vegan Society does recommend that every vegan should make sure to get enough vitamin B12. The ALW ended with an interesting workshop on the right to protest and how to deal with local authorities and police. Again, the presence of some long-standing activists proved very helpful, because they could provide first hand accounts of theoretical rights being abused in practice, and the experience with courts. A very successful ALW, in which more than 10 different people had held workshops, came to an end. All ALWs this year in Austria so far had a lot more participants than in the ALW series in 2005. Animal industries will have to prepare themselves for a new wave of protest, unprecedented in the history of this country.